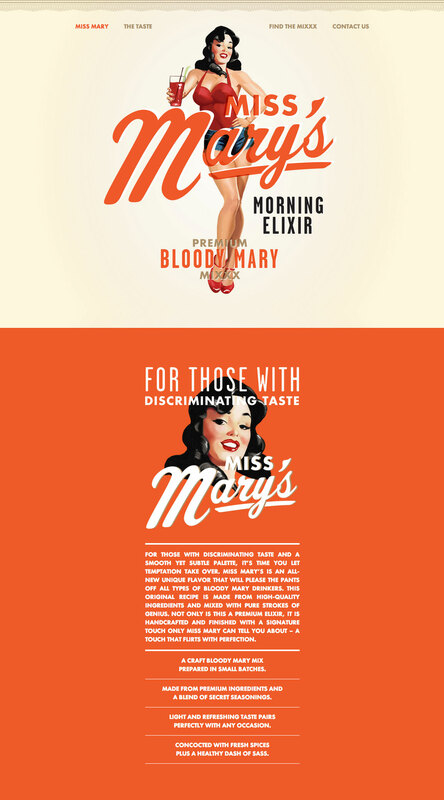 Stylish One Pager for ‘Miss Mary’s Morning Elixir’ – a premium Bloody Mary mix. Really like the revealing curtain effect. For those with discriminating taste and a smooth yet subtle palette, it’s time you let temptation take over. Miss Mary’s is an all-new unique flavor that will please the pants off all types of Bloody Mary drinkers. This original recipe is made from high-quality ingredients and mixed with pure strokes of genius. Not only is this a premium elixir, it is handcrafted and finished with a signature touch only Miss Mary can tell you about – a touch that flirts with perfection.